Back pain, in particular lower back pain, sciatica and ‘trapped nerves’ are among the most common reasons adults seek osteopathic treatment. This is unsurprising, given that up to 80% of people will suffer from back pain in their lifetime (Walker, 2000). The fact you are reading this, probably means you have personal experience of back pain or know someone who does. If so, don’t despair, there is plenty you can do to alleviate your pain and reduce the risk of reoccurrence. There are many causes for back pain, but lifestyle is nearly always a significant factor. For example, if your job involves sitting at a computer all day or lots of driving, you are more likely to experience back or neck pain than other people. At the other end of the scale, a sudden increase or change in activity can also be bad for your back. The thing we have less influence over is age. Incidence of back pain increases the older we get, due to normal age-related changes, such as gradual loss of disc elasticity and ‘wear and tear’ to spinal joints. 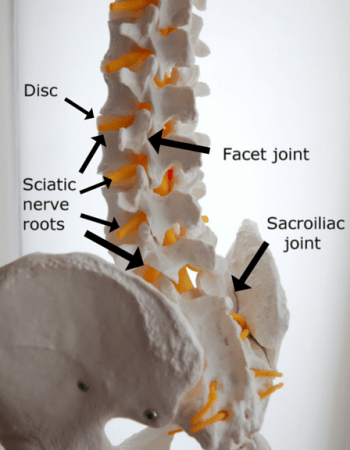 The sciatic nerve roots are located between the spinal vertebrae. They can be irritated or compressed by a disc herniation or prolapse, or from age-related arthritic bony growth which can irritate the nerve root as it exits from the spinal column. Upper back pain, which can also radiate around the ribs and into the neck is usually caused by injury or wear and tear. It can affect the structures in the upper back including facet or rib joints, muscles, ligaments and sometimes discs. The NHS recommends manual therapy (which includes osteopathy) for low back pain treatment (NICE, 2016). It can also help relieve related symptoms of sciatica. An osteopath will conduct a thorough assessment to to work out what is causing your pain and how best to treat it. Osteopaths will usually (but not always) work on the symptomatic area of your back. However, they will also look beyond to other areas of restriction or dysfunction which may be contributing to the problem. Read more about osteopathic treatment. Most back pain can be treated effectively with osteopathy. However, sometimes an osteopath may need to refer you to your GP for further tests or scans. This may be because symptoms are not improving or to rule out less common causes of back pain such as referred pain from conditions affecting internal organs. Keep active and move as much as possible. Just a few minutes gentle walking or stretching each hour helps enhance blood flow, which in turn promotes healing. Avoid heavy lifting or high-impact exercise whilst your back is healing. Try using ice or heat: read my blog post for more detailed advice on this. Anti-inflammatory pain medication such as ibuprofen can help when used in moderation. Consult your GP or a pharmacist for advice. When sleeping, use pillows for extra support. Depending on what is causing your pain, try a pillow under your knees, between your knees (side-lying) or under your tummy. Try to stay positive. Most back pain is not permanent and will get better, if you look after yourself and follow this simple advice.